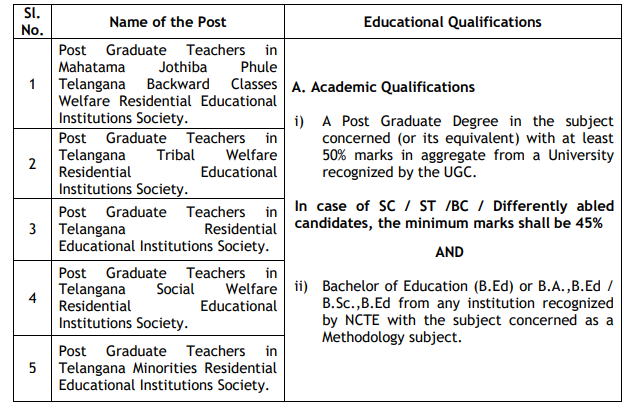 Telangana Residential Educational Institutions Recruitment Board (TREIRB) has advertised for the recruitment of Teachers TGT / PGT jobs vacancies. Interested and eligible job aspirants are requested to apply on or before 08th August 2018. Check out further more details below. candidates have to ensure that there are no mistakes in it. The Board bears no responsibility for the mistakes, if any, made by the candidates. STEP II: After entering the details in the Portal, the applicant will proceed to payment gateway. STEP III: The applicant should pay the prescribed fee as specified through any of the three modes viz. Debit Card, Credit Card and Net Banking. Separate instructions have to be followed for each mode of payment. STEP IV: After payment of fee & after filling the entire application form, the PDF Application will be generated which contains the particulars furnished by the candidates. The ID No. in the PDF Application form has to be quoted for future reference /correspondence. ii) For any Technical problems related to Online submission and downloading of Hall Tickets please contact 7032619292 (Call Time: 10.30 A.M to 1.00 P.M & 1.30 P.M to 5.30 P.M) or mail to helpline.treirb@gmail.com. iii) For any General Queries please contact office of the TREI-RB Phone No.040- 23317140 or 040-23317130 (Call Time: 10.30 A.M to 1.00 P.M & 1.30 P.M to 5.30 P.M) or mail to helpdesk-treirb@telangana.gov.in. vii). Pass certificate in TET Paper-II of TS TET/AP TET (up to 02.06.2014)/CTET. viii). Other certificates if any. ii). Non-Creamy Layer Certificate as per Form- VIIB / Creamy Layer Certificate as per Form VIIC. iii). Certificate of Residence / Nativity (where the Candidates not studied in School / Private Study). iv). Local Agency area certificate. a) Medical Certificate for the Blind. b) Certificate of Hearing Disability and Hearing Assessment. c) Medical Certificate in respect of Orthopaedically Handicapped Candidates.